Gateway to rock cut cave temples of Ajanta and Ellora, Aurangabad is a central hub for flourishing arts & commerce. 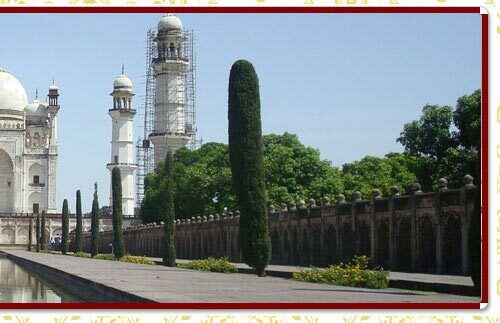 Named after Aurangzeb, the Mughal city of gates developed its own culture and is presently the tourism capital of Maharashtra. Main Attractions: Bibi-ka-Maqbara, Daulatabad, Ellora, Ajanta. 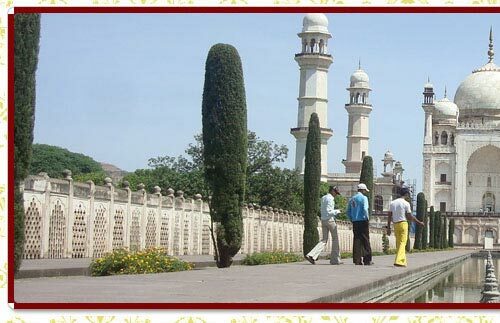 Geographic: Situated in the historic Marathwada region of Maharashtra, Aurangabad is a city with a rich historical heritage spans almost thousands of years. Famous for: UNESCO world heritage sites of Ajanta & Ellora caves. By Air : The airport is 10 kms east of the city. By Road : Pune is six hours, Nasik is five hours overnight journey to Indore or Mumbai. By Railways : The two direct lines are to Mumbai (375 kms) & the other to Manmad (113 kms). Aurangabad has always been a center of arts & commerce. The main city was founded in 1610 under the Nizam, however it went on to develop its own distinctive culture & came into prominence after its patronage by the Mughal emperor Aurangzeb who went ahead to make it his capital. Aurangabad also has its own rich tradition of textiles & handicrafts such as the Paithani & Himroo, boh of which should surely be sampled as part of any Aurangabad. This monument was built in memory of emperor Aurangzeb's wife by her son in 1679. Although built in the imitation of the Taj Mahal, it is not quite as distinctive a piece of architectural excellence; however the mausoleum & the surrounding gardens are well worth a visit. Around 13 kms from Aurangabad is the formidable hill top fortress of Daulatabad, built by the 14th century quixotic Delhi sultanate emperor, Muhammad Tughlaq. Some notable features of the fort are 5 kms of sturdy ramparts, the Chand Minar - soaring 60 mts, the Chini Mahal & the famous 6 meter cannon of Aurangzeb, cast from 5 different metals. Ellora, a part of Aurangabad city guide, is a UNESCO world heritage site comprising collection of temples, monasteries & chapels dating back to almost 600 AD. A zenith of rock cut cave architecture; the caves unite Hindu, Jain & Buddhist sites co-flourished together. The art captured for eternity in the rock cut facades of the caves infuse not just a meditative calm as you wander through them but also a great sense of drama & synergy, as you witness rock coming to life as they were. A special mention is deserved by the Kailasa temple, an unrivaled centerpiece of Ellora. Carved out of the single rock, this temple was designed to recall Mount Kailash - abode of Lord Shiva. It looks like a freestanding, multi-storeyed temple complex, it is the most challenging architectural feat achieved ever. Apart from the sheer extravagance of the scenes depicted, it's the sheer size that will sweep you off your feet. Another UNESCO world heritage site, Ajanta is about a series of sublime tempera paintings which have miraculously survived almost a staggering 2200 years! Arguably ranking amongst the best paintings ever produced, Ajanta is a magical window to the beautiful life & times of the people of an ancient age.